My background is in ecological modelling and computational science I graduated from the University of Twente (Netherlands) with a Masters in Geo-Information Science and Earth Observation in 2015. My dissertation dealt with predictive modelling of Bengal tiger distribution in northern India. My interests lie in how species interact in varied environments and hence I have been researching the effects of anthropogenic stress on tiger distribution, and the impacts of tigers on their prey base and co-predators. The European red fox (Vulpes vulpes) is known to be the most common and widespread of the world’s 12 true fox species. In the early 1850’s the red fox was introduced in Australia mainly for hunting purposes. Since then foxes spread rapidly, and by 1930 they inhabited most parts of Southern Australia (Saunders and McLeod, 2007). Foxes are highly adaptive to a variety of habitats, encompassing arid, alpine, forests, coastal heathlands and urban environments. However, foxes do not occur in tropical northern Australia, reasons for which may be attributed to climatic preferences and food supply. The fox is a land-dwelling carnivorous mammal that can feed upon almost anything depending upon availability; however, its main source of food is small animals (Department of Agriculture and Fisheries, 2015). In Australia, predation by invasive foxes is considered a major contributor in the decline of a number of native species such as mallefowl, rock wallaby and the night parrot (Kinnear et al., 2002). It also causes significant economic losses to farmers by preying on livestock. Due to its impacts on native fauna in Australia, the European red fox is listed as a key threatening process under the EPBC Act (DEWHA, 2008), and fox populations are being controlled, with varying degrees of success, by using conventional techniques such as shooting, poisoning and fencing (DEWHA, 2008). The ecology of red foxes in urban environments have been minimally studied (e.g. Marks and Bloomfield, 2006). Consequently, we have limited understanding of the repercussions on their prey species in human-altered environments. No studies have assessed ref fox habitat and prey preferences and species interaction across an urban to natural land use gradient. This project is designed to address this research gap. The outcomes of this research will aid in developing effective fox management strategies and conservation policies, and will help raise community awareness. Assess the movement ecology of foxes across an urban to natural land use gradient, from Sydney City through the suburbs to the Blue Mountains National Park. Assess foxes preferred hunting, loafing and denning habitat across an urban to natural land use gradient. 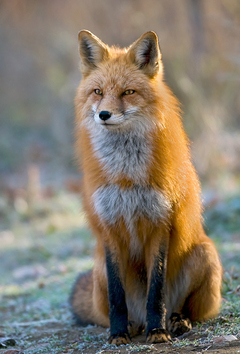 Assess native species’ behavioural responses to foxes, before and following fox management. Assess the movement ecology and population connectivity of Swamp wallabies, Wallaroos and Eastern grey kangaroos, in relation to the presence or managed absence of foxes.